CAD-CAM software is typically used by manufacturing industries such as Custom Woodworking, Furniture & Cabinet Making among others to create and manage CNC programs for their job production because of the capabilities it gives them. It is these types of industries that generally use custom shaped tools to easily machine intricate shapes and edges to their parts with CNC machinery. And this is where CAD-CAM software can be the difference maker in turning out profitable jobs in short order. Custom tools are used in most, if not all, industries. An example of custom tools being used in the Mold Industry is when special tapered shank tools like ball and lollipop or special long reach cutters are used. A commonality between shops in the industries listed above is the need to use custom tools inside their CAM system for toolpath creation and accurate simulation to properly machine their unique parts. The latest BobCAD-CAM V28 CAD-CAM software now has the ability to create custom form tools based off of a CAD geometry profile. 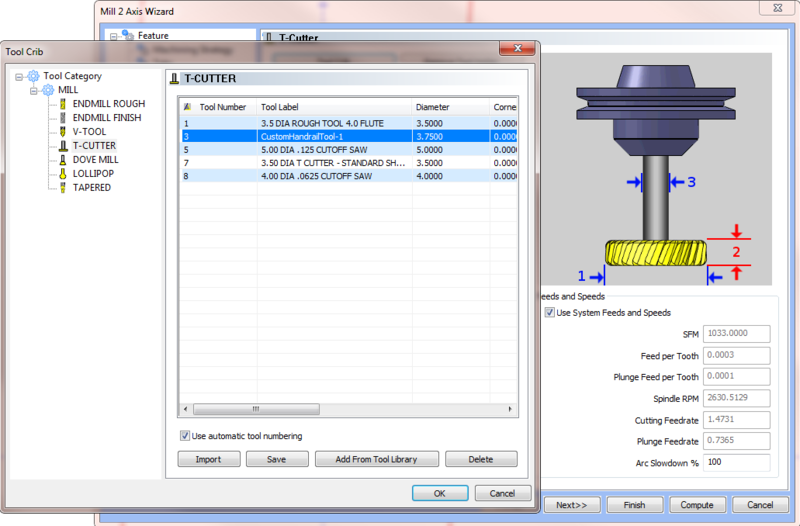 Once the software is used to create the toolpath strategy, the operator can then simulate the job in a virtual machining setting where the custom tool is visually seen in the process. Simulation provides many advantages that include cycle time calculations and a visualization of the machining process while using the machine tool, work holding and more. Thus, eliminating the possibility of costly machine collisions and/or scraped parts due to gouges. When creating milling tools inside of BobCAD-CAM V28, you can now assign geometry to define custom shaped tooling or form tools. In addition, you can define the cutting and non-cutting portions of the tool, making it easy to create tools that have more than one cutting area. Simply draw half of the tool geometry profile to revolve, assign it to the tool and get accurate program simulation for the job. The advantage is that the toolpath is being inspected inside the simulated machining environment properly so that the process can be verified before ever being sent to the actual machine tool. In the following example A) shows the profile geometry of the form tool that is being used to load the new tool into the tool database. B) shows the form tool being used in simulation to visualize machining before the NC program is sent to the machine tool. This custom form tool feature makes CAD-CAM software programming more productive for any CNC business wishing to get the most out of their CAM investment. You can get a FREE V28 CAD-CAM demo at bobcad.com today! Or call (877) 262-2231 x123.